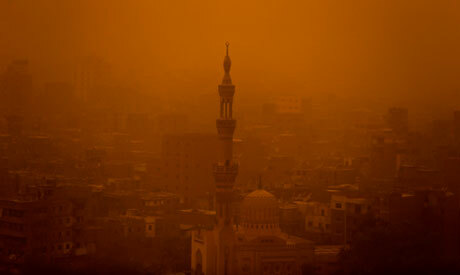 Egypt’s Meteorological Authority (EMA) warned on Monday of a sand storm that is expected to hit the country from Wednesday till Saturday. The storm will reach its peak on Thursday and Friday, with low temperatures expected starting Wednesday in Cairo and most of the country's governorates, EMA head Ahmad Abdel-Aal said in a statement. Rains are also expected in the next coming days in most of the country. Abdel-Aal advised citizens who suffer from dust allergies to take precautions over the coming days, and warned citizens to stay away from trees or advertising bill boards. Abdel-Aal also advised citizens to wear heavy winter clothes and drive slowly.